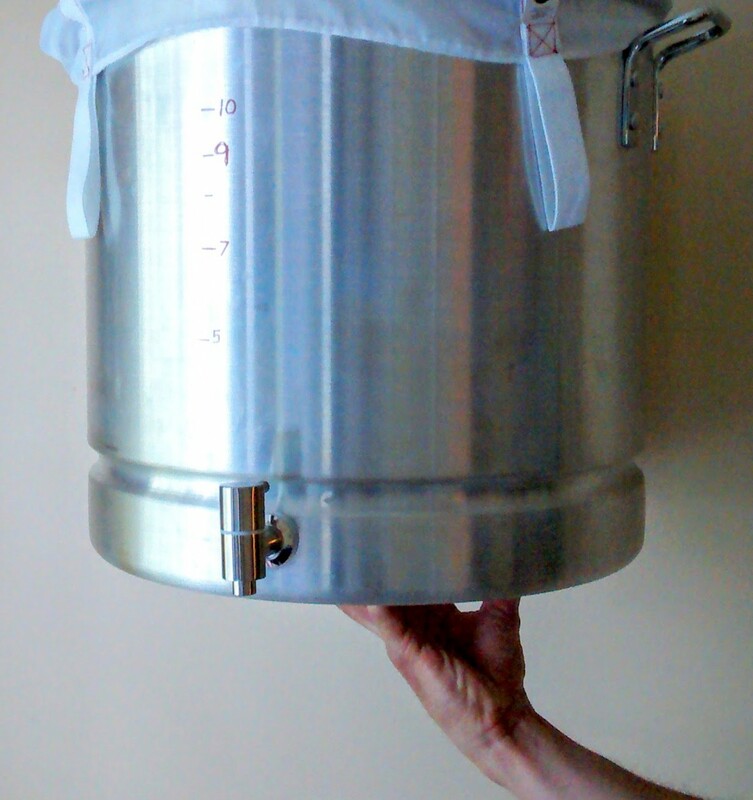 I must admit, with this whole One Pot Brewing experiment, fermenting in aluminum was my greatest fear, concern, worry, and experiment. It seems like nobody ferments in aluminum. Why? The internet has a lot of nay-sayers (mostly with dumb reasons like “I would just go with stainless, man”). The one legitimate reason I found was this: Would the low pH levels of fermenting beer “leach” from the aluminum, thus making my beer taste like metal? One way to find out. I was willing to fail. Well, I don’t know the science that well, but I do know this: it works just fine because I tried it. My first batch (Spring Victory) didn’t taste like aluminum. Nor did my second batch (English IPA). No off-flavors detected by me or my wife (those are the people who count…I’m not brewing for a BJCP judge). Looking at the ingredients, it tastes like the beer I made. Neither did batch 3 (DIPA) or batch 4 (Belgian Trip). This is great news, considering that an aluminum pot costs significantly less than stainless steel, that it’s a great conductor of heat, fast to heat and cool, light, easy to carry around, available through restaurant supply stores in larger sizes, and easy to punch a hole into (for the spigot, to bottle with). Don’t get me wrong: if money wasn’t an issue, I would probably get a nice stainless steel pot instead, with a perfectly fitted lid and perfectly designed spigot. That’s great news that no off-taste was found, but is there any safety concern? I’ve made no research, so I ask you this in total faith 🙂 What is the thing no-sayers were referring to, and is it something that you could actually taste? Good question Micha. I don’t know of any safety and/or health concerns and haven’t come across any on the internet either. I didn’t die yet, and I feel pretty good. One person wonder if that perhaps the pH levels would make the beer taste like aluminum, but they didn’t mention any health concerns, just taste. Turns out that’s probably wrong. I remember reading a post that quoted an actual metallurgist (John Palmer I believe), which said aluminum is okay (as long as there is an oxidation layer that protect the beer from the metal…that dark stuff that forms on the inside of the pot). The fact that nobody ferments with aluminum (or SS for that matter) – I think that’s a product of the homebrewing business (they want you to buy many vessels, not just one). Commercial breweries, of course, ferment in SS – so would I, if I were dealing with huge batches. I know that restaurants cook with aluminum pots every single day, but I’m not sure if that translates to fermenting, or if that’s relevant.